HONG KONG—A high-ranking official in the Chinese Communist Party spent three days in July meeting with several important Hong Kong citizens, promoting the chief executive’s opinion on universal suffrage. Such promotion goes against the views of the top leadership in Beijing, according to China experts, and serves to inflame the situation in Hong Kong. On July 15, Hong Kong Chief Executive Leung Chun-ying submitted a report to the CCP’s National People’s Congress (NPC) on whether Hong Kong citizens should be allowed universal suffrage in the next chief executive and Legislative Council (LegCo) elections. Leung’s report stated that Hong Kongers should have universal suffrage for the chief executive election, but not for the LegCo election. It also stated that chief executive candidates should be chosen by the Beijing-controlled Nominating Committee rather than civic nomination. Many Hong Kong lawmakers expressed dissatisfaction with the report, saying it distorts the facts about public opinion and that what it describes is not true universal suffrage. Hong Kong society is still waiting for an official decision on the subject from the NPC at the end of August. In the meantime Politburo Standing Committee member Zhang Dejiang came to Shenzhen City in southern China near Hong Kong. Zhang holds the CCP’s portfolio for Hong Kong and Macau, and for three days starting on July 19 he met with 10 groups of people at the Shenzhen Zijing Hotel. At the meetings he praised Leung’s report. Zhang first listened to Leung’s report, then met with key members from six major chambers of commerce in Hong Kong. It has been reported that NPC Standing Committee deputy secretary-general Li Fei, Hong Kong and Macao Affairs Office Director Wang Guangya, and Director of the Liaison Office Zhang Xiaoming also attended the meetings. Zhang added that civic nomination—the public directly nominating candidates through one method or another—was illegal and the central Chinese government would not accept it. Meeting participants also reported that Zhang said the planned Occupy Central protest for universal suffrage in Hong Kong was illegal and civil disobedience would not threaten the central government. He said universal suffrage in 2017 is not the ultimate goal, and Hong Kong people have to accept Leung’s method of choosing chief executive candidates, the participants said. Zhang told the business circle that there are people who wish Leung would step down, but he emphasized that this would not happen. He praised Leung for taking responsibility and working hard, and he urged the business community to support Leung. According to U.S.-based China affairs expert Liao Shiming, Zhang’s public support of Leung did not reflect the views of the current authorities in China, but appeared to be just Zhang’s personal opinion. He said Zhang’s remarks reveal the split in the CCP leadership, and Zhang is at risk of being purged by current CCP leader Xi Jinping. Xi has been investigating supporters of his rival, former CCP leader Jiang Zemin, and having them removed from their posts. Liao described how Xi has been taking down Zhang’s allies, including Xu and several of Zhang’s supporters in China’s Jilin Province. China affairs expert Ji Da said Zhang supported Leung, but who will support Zhang? Zhang is in a dangerous situation, Ji said, and the more he supports Leung, the more dangerous Leung will be. Now Leung is in an even worse situation. On July 21, Hong Kong’s Chief Secretary for Administration Carrie Lam Cheng Yuet-Ngor led three members of the Task Force on Constitutional Development to answer questions at the LegCo. Pan-democratic councilors expressed anger about the CCP’s control over constitutional reform in Hong Kong. Civic Party member Chan Kar-lok was dissatisfied with the Hong Kong government’s subordination to the will of Beijing. He was unhappy that the Hong Kong government had no intention of fighting for genuine universal suffrage for the Hong Kong people. “Zhang Dejiang is in Shenzhen to unify people’s thinking, which is the CCP’s strategy of consensus of opinion. They each went up there to accept the order, then came back and repeated the same sentence,” Chan said. 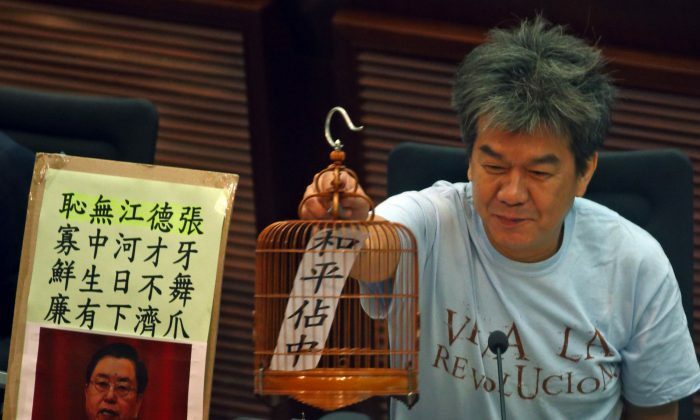 Legislative councilor Leung Kwok-hung used a birdcage prop to satirize the Chinese and Hong Kong governments’ giving Hong Kong people a “birdcage constitutional reform.” The reform is like a birdcage because it is closed off from but visible to the public. At the same time, democracy itself is locked in the cage. Civic Party member Claudia Mo Man-ching criticized Chinese officials and the pro-establishment camp for continually asking pan-democrats to compromise and accept the filtered constitutional reform package. She criticized Lam and Beijing for jointly deceiving Hong Kong people. Civic Party leader Leong Kah-kit asked Lam if she would consider arranging for democratic councilors and other groups’ members who raised methods complying with international standards to meet with relevant officials. Lam expressed her willingness to act as a bridge, and Mo was not dissatisfied with her answer.